Vincent van Gogh is not only the artist who painted the Potato Eaters, he is also known as the man who cut off his ear, the man who drank turpentine, the man who sold only one painting during his lifetime but became famous posthumously. In 1885, Van Gogh painted several versions of the Potato Eaters when he lived in the small village of Nuenen (the Netherlands). The final painting hangs in the Van Gogh Museum in Amsterdam. Below: The Potato Eaters, preliminary sketch on view in Kröller-Müller Museum in Otterlo (The Netherlands). Vincent van Gogh often worked in the cottage of the De Groot family in Nuenen. 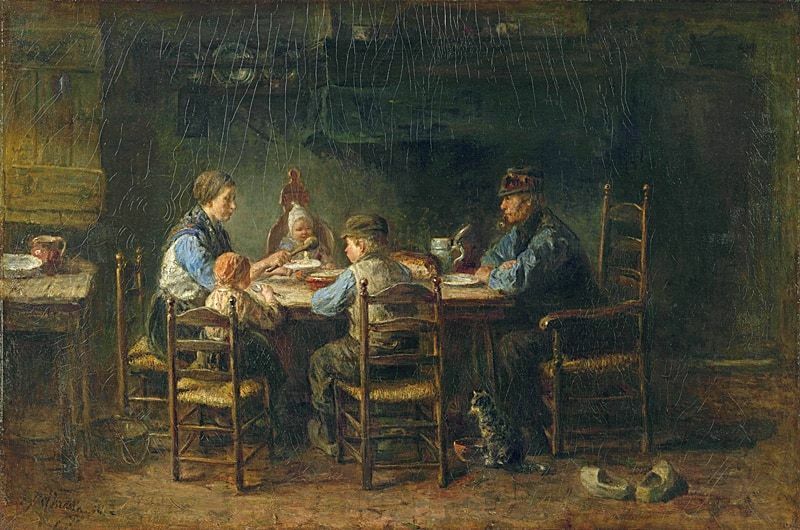 This family inspired him to paint the Potato Eaters, a painting depicting a homely scene. A pool of yellowish-red light shines on the five members of the De Groot family sitting at the table, a dish of steaming potatoes in front of them. Coffee is being poured. All reach out towards the food. Peasants gathering for an evening meal was not necessarily a new subject for paintings. 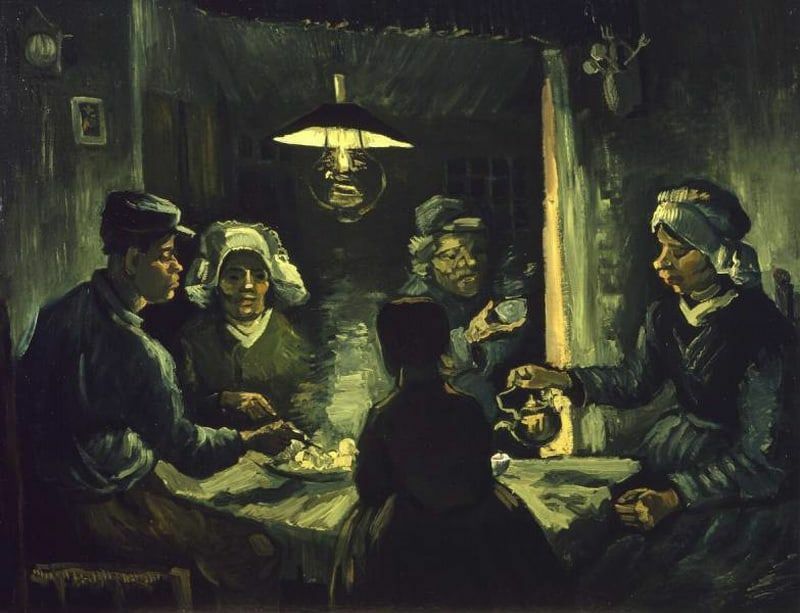 Jozef Israëls, Van Gogh’s contemporary, had painted a similar scene. Van Gogh had seen Israëls’ painting because he described it in one of his letters to his brother. 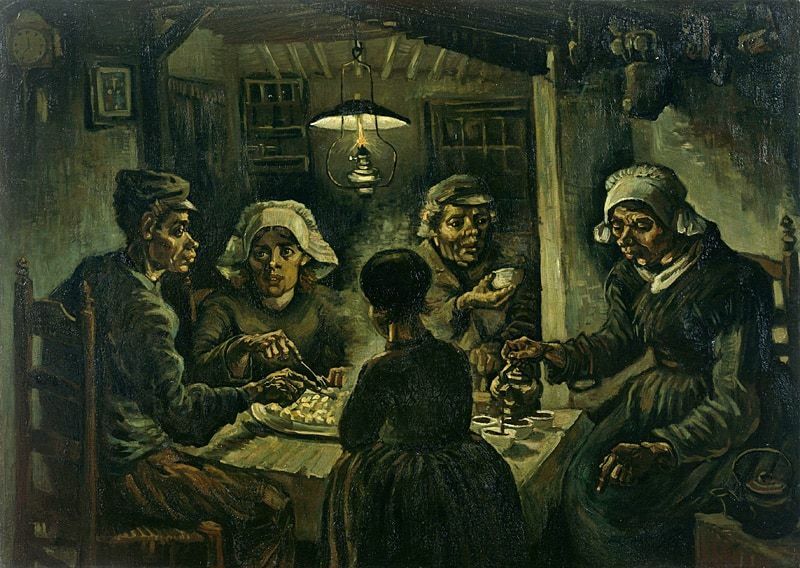 The Potato Eaters was Van Gogh’s first painting depicting a group of people. His initial composition studies – a drawing and a sketch in oils – showed only four persons sitting round the dish of potatoes on the table. When he added a fifth person, the others had to move up because the woman on the right was now too far away to reach the potatoes. Hence Van Gogh gave her a task – pouring coffee – although it was, and remains an odd dinner combination. Although Van Gogh painted the scene in his studio from memory, the Potato Eaters evolved from of numerous portrait studies of peasants. His favourite models were the members of the De Groot family because of their expressive faces. Van Gogh regarded this painting as his first great work of art. Even though he did not draw correctly proportioned hands or heads, Van Gogh felt he had captured general expression and gestures . The dark setting and pool of light also evoked Rembrandt, one of Van Gogh’s favourite artists. Van Gogh wrote numerous letters discussing and explaining his paintings to his brother Theo. In one of them he wrote: I have tried to bring out the idea that these people eating potatoes by the light of their lamp have dug the earth with the self-same hands they are now putting into the dish, and it thus suggests manual labour and a meal honestly earned. He regarded peasants as primitive people who lived in harmony with nature. That is why his models were raw-faced, their hands and faces big, gnarled and earthy. The Potato Eaters: A Masterpiece? Van Gogh regarded the Potato Eaters as a masterpiece and wanted to show that he was on his way to becoming a realistic figure painter. The painting did not impress the critics because they did not think it realistic enough. Van Gogh’s figures had ungainly faces and looked awkward, not the type of people a potential buyer would like to hang on his wall. Critics commented on the anatomical anomalies, and they were right. However, Van Gogh did not strive for beauty. He wanted to convey a sense of hardship and survival. Had he painted handsome people and pretty surroundings, his message would not have come across.